Number one of a series on modern hurricane or cyclone construction. This is just few personal and not too technical thoughts from a survivor of a few tropical cyclones. 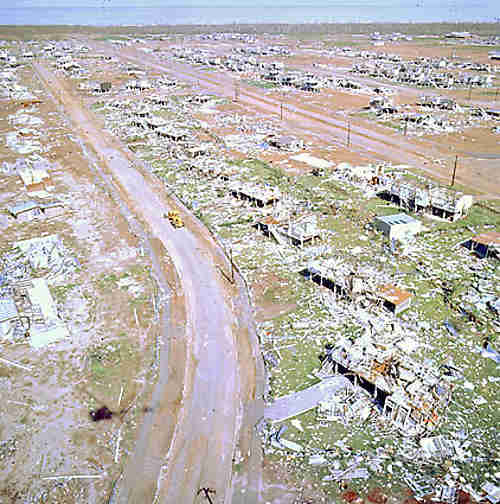 Cyclone construction - This is a shot that I lifted from Wikpedia showing damage in Darwin after the devastating Cyclone Tracy swept over our city on Christmas Eve 1974. Our house was a couple of miles to the left of those in this photo. We had a party on the night of Christmas eve 1974. Unfortunately that night we had an unwelcome guest, a girl named Tracy, and for those of us that met her close up we will remember her for the rest of our lives. 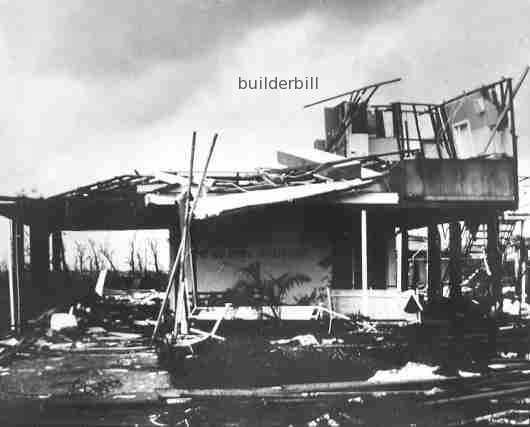 Cyclone construction - Damage to a typical high set Darwin home. Suburb of Nakara. This was the home of a couple of our good friends, John and Lyn, and it was a typical high set timber frame home set on 225 x 225 concrete piers. These were for the most part between 2400 x 2700 high to give space under the house for parking, laundry and storage. The main reason though for the elevated style is the ability to catch a cooling breeze in our tropical climate. Cyclone Tracy was quite small as cyclones or hurricanes go, but very intense. It hit the smallish town of Darwin (at a guess, then about 110,000 population) which is were I live just about dead center. It is reported that 71 people died that night, possibly more. It created all the havoc that that we have come to associate with this type of event from TV and newspaper coverage. Immediate loss of power and other services. Early fears of disease, lack of food and shelter caused a huge evacuation of women and children by air and many others were assisted with the long trip south by road. Cyclone construction - HMAS Attack, a naval patrol boat was driven into and under Stokes Hill wharf. 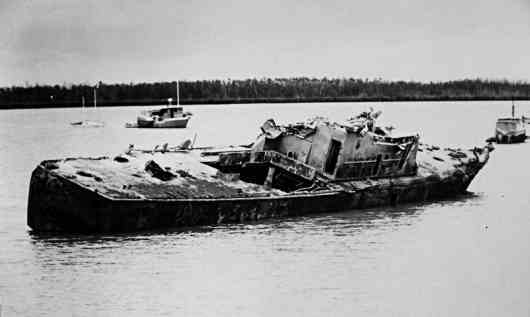 Not just enemy action can damage a warship. Cyclone construction - a common sight for years afterwards, this is the last that I know of. Twisted power poles as garden decorations were used as stark reminders of the awesome power of the wind. 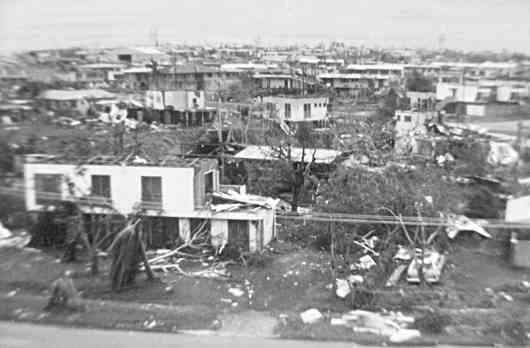 Cyclone Tracy forced the Australian authorities to rethink and to rewrite the rule books regarding building houses in Cyclonic areas. Prior to the cyclone homes were built more or less on the assumption that if they were strong enough to hold themselves up in position, with an extra amount for safety, and a token amount of bracing, then the actual weight of the structure would do the rest. None of us could foresee a time when a whole house roof could be sucked off with the walls following shortly afterwards. What need was there to stop a floor lifting upwards? Yet that is exactly what happened to a good friend of ours, Clarkie had to cling to the floor of his house while it travelled a hundred meters or so down the street. He calls it his "magic carpet ride". I have been pottering about the web for the last couple of years since I retired, reading up on home building and construction related subjects while building this web site, and I am coming to the conclusion that possibly we may have the best set of building codes and regulations in respect of building in cyclone or hurricane prone areas in the world. In the good old days, prior to Tracy we used to build timber frame houses much the same as people in North America still seem to be doing. Cyclone construction - This sketch relates to one of those high set houses like in the photos above and will give you an idea of what we called good practice in those pre-1974 days. Bear in mind when looking at these sizes that we used almost exclusively hardwood timber that is at least double the strength rating of softwood. Top and bottom plates were typically 75 x 50 checked out 12mm for the studs. Bottom plates nailed to each floor joist and double joists at cross walls. Studs were 75 x 50 at a maximum of 450 ctrs. fixed with 2/75 nails. Some of the older houses had studs at 600 ctrs. 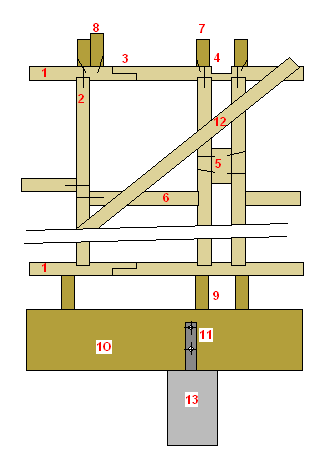 A halving joint in the plate, taking away at least half the strength of the timber. I say at least half because over enthusiastic nailing would sometimes split them and weaken the join further. Another halving joint to receive half of the cross wall stud, as these always had two studs either side, it meant that only a quarter of the strength of the plate remained. Think about it. All this was written down in government specifications as being good construction practice. A spacer block between double studs. These are to stiffen the studs and also to fix the side walls to. Again quite often peppered with so many nails that they split and became useless for the intended purpose. (Some guys had nail guns even in those days). 75 x 50 noggins, either staggered like shown so that they could be nailed through the studs or in line, in which case they were stitch nailed. In the 2700 (9ft) high rooms there were two rows of noggins. Rafters 150 x 50 at 900 ctrs stitch nailed to plates. Ceiling joists 120 x 50 at 900 ctrs stitch nailed to plates. Floor joists 150 x 50 stitch nailed to bearer. 225x75 HW bearer. Usually spanning say 3500 max. 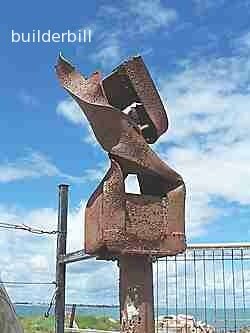 Steel plate, cast into the concrete column and bolted to bearer. Note! Just about the only structural bolts in the house. 50 x 16 timber braced checked 16 into the studs and plates further weakening the studs. Concrete column 225 x 225 with 4/R12 rebars. The stud walls are always assembled on the flat with any bends or bows up. This makes it easy to the plates to them. If the bows were down some of them would rock about. The main reason of course is that this avoids getting a one up one down effect which doubles any possible difference. (This is a fairly universal principle with joist and rafter also. Cyclone construction - When the wall is in place but before the noggins are fixed, any studs that stick out are straightened by the following method. The offending stud has a saw cut a half to two thirds the depth of the stud cut into It. One guy levers the stud inwards using a spare length of timber against the next stud. The saw cut opens up and another guy drives a timber wedge into the saw cut. This fixes the stud in it's new position. A couple of cleats are nailed either side of the saw cut to give back some of the strength that the saw cut has taken away. Needless to say a few of these in a wall made it a lot less resistant to wind driven flying objects from the outside. Ground level timber frame houses were built very similarly, mostly sitting on a concrete raft slab with a sprinkling of hold down bolts. They suffered slightly less than the high set ones. Cyclone construction - Section through the wall of a cavity brick house. Brick houses on the ground are another category that were common in Darwin at the time. These for the most part fared a lot better than the timber framed ones. The walls were sat on raft slabs and were mostly cavity brick construction. I have seen a friend's house built like this, and on the face of it the place had suffered little damage. He was surprised when I told him that the whole roof had lifted up,including the 275 x 300 deep concrete bond beam attached to it, at least on one end. When he asked me how I could tell I pointed to the curtains. From the outside of the house we could see parts of the curtains that were hanging down the outside wall from the joint between the ring beam and the brickwork. When the roof had lifted the curtains had been sucked through the gap. It would take little imagination to work out the consequences of a roof like this bumping up and down on top of cavity brick walls over a longer period of time. The mass of the concrete bond beams clearly helped this type of house to keep their roofs on, but they were not what we would now call cyclone construction. I am not going to talk about commercial buildings here, but I remember seeing a concrete bond beam to a thee story block in town, with one end of the beam still on the wall and the other end laying on the ground. There were a few ground level pre-cast concrete houses built prior to Cyclone Tracy, and I guess that their owners had every right to think that their homes were "bullet proof". You can't get much stronger walls than solid concrete. Not true, they were in fact death traps. What happened was that the wall panels were not adequately anchored or tied together. They were sitting there held in position by their own weight and the roof structure. When the roof structures started breaking up, then the walls collapsed like a stack of cards. Hilary (SWMBO) and myself actually did go to a party that night, it was Christmas Eve after all. We left our two youngsters with John and Betty. As John tells the story, when the cyclone started to bite he could see through the windows by the lightening flashes, that the near bye houses were suffering. When the eye came over, in the calm he ran out and gathered up a few of the neighbours to shelter in his house, "solid brick, we'll be safe there". When the storm came back they were safe until some lump of flying debris blasted through a wall and the whole house blew apart around them. Incredibly not one of them, six adults and about 12 assorted kids were seriously injured. They spent the rest of the night sheltering in concrete pipes in a near bye children's playground, moving into different pipes as the wind swung round. John's almost new house was in fact not solid brick as he had thought, but brick veneer. That is a timber frame house, using for it's external cladding a single skin of brickwork. That house was reduced to a pile of rubble in a very short time. You may be thinking that we were a bit stupid to do what we did, go to a party and leave the kids elsewhere with the threat of a cyclone looming. In fact we knew very little about it. The most we heard on the radio were the same generalised warnings that we had heard before from time to time. I firmly believe that someone knew, but that it was kept quiet to prevent panic. Friends holidaying in Brisbane 3000 km away knew more about it than we did. Their TV gave reports that a severe cyclone was heading for Darwin. We were not told the severity or how imminent it was. A recurring theme in Tracy survivors stories, is that when the windows started blowing in, people instinctively took shelter in in the smallest rooms in the house. The bathrooms and toilets. While the larger walls fell flat or blew away, these short walls with small windows, held together better. Some of them leaning and wedging against others, leaving spaces for families to shelter.